What do alcohol, government / not for profit and FMCG brands all have in common? They were the top performing advertising sectors to be awarded an abundance of Gold, Silver and Bronze trophies at the Festival of Media LatAm Awards 2018, taking home almost half (48%) of the total awards handed out, between them. Alcohol was the top performing sector, accounting for 18% alone. This was followed by the government / not for profit / charity sector at 16% and FMCG at 14%. Food & beverage, personal care and beauty, sports and entertainment, retail, technology, finance, travel and telecoms were also represented, with brands in these sectors taking home at least two awards each. By country, Mexico came out on top with almost a third (30%) of winning campaigns coming from this market. Colombia took home 20% of all awards and Argentina 14%, while Dominican Republic put in a good show with six awards, plus Brazil and Puerto Rico with three wins each. MediaCom, awarded ‘Agency Network of the Year’ and MediaCom Mexico ‘Agency of the Year’, showed the strongest agency performance after walking away with more than a quarter of the available trophies (27%), followed by Initiative at 20%. Both UM and OMD represented 12.5% of the winning campaigns each, with further awards for Havas Media, S4M and PHD. While the standard of work across the board was very high, there were three stand-out campaigns in particular to be awarded three or more times across different categories. For this week’s Festival Intelligence, we turn the focus to these campaigns to reveal the key trends and themes driving creative excellence across the LatAm region. Cerveza Victoria’s ‘Lo Chingón Está Aquí’ by MediaCom was this year’s Festival of Media LatAm Awards ‘Campaign of the Year’ — a reflection of its success in winning five trophies (it was shortlisted in six categories) including Gold for ‘Best Integrated Campaign’ and four Silvers for ‘Best Branded Content’, ‘Best Communications Strategy’, ‘Best Launch Campaign’ and ‘Best Campaign for a Local Brand’. Judges applauded the campaign for its “bravery in championing an important social issue in Latin America, and creating something with an authentic fit within the brand’s heritage and values”. 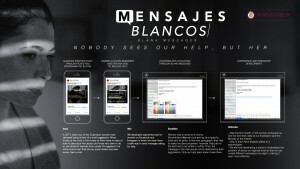 The campaign set out to bring attention to the huge injustice around “Morenos” – Mexicans with brown skin, who are the native people of the country but had become a marginalised part of society. Having long championed the country’s history and heritage, the challenge for Mexico’s oldest beer brand Cerveza Victoria was to confront Mexicans’ behaviour, showing them that racial discrimination against Morenos rejects the very notion of who Mexico is as a country. By doing this, it would inspire change by creating a surge of public support for the introduction of a new law requiring brands to accurately represent Mexican diversity in advertising. Starting with a “hidden camera” video, the campaign kicked off on Facebook and soon went viral across all social media platforms, being shared over 1.5 million times in just 19 hours. National news jumped on the movement too, spreading the message across the entire country and beyond. A second video followed and alongside its public messages, the brand also pledged real change by committing to only using Mexican talent in its advertising in order to celebrate Mexico’s diversity and foster a climate of inclusivity in this important area of culture. Also see here: Festival Intelligence: Alcohol brands lead Mexico’s charge to digital. 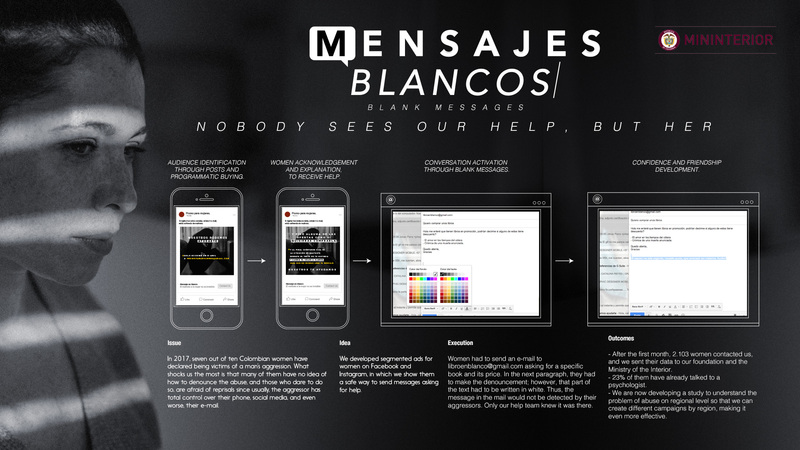 The ‘Mensajes Blancos / Blank Messages’ campaign, also by MediaCom, for Ministerio del Interior was the recipient of the most Gold awards for one single campaign, collecting trophies for ‘Best Engagement Strategy’, ‘The Creative Use of Media Award’ and ‘Impact Award’. Judges were impressed with the “intelligent strategy” and voted unanimously for its creative use of media. In another example of an advertiser taking on something with a greater purpose, the Government, along with private companies such as Profamilia, The Pro-Welfare Association of the Colombian Family, had been trying to curb the wave of violent abuse that Colombian women were experiencing from their aggressors. The problem was that very few have been called out because male aggressors intimidate their partners, and come to control them so much that they have access to their phones, WhatsApp, social media and even their email accounts. Ministerio del Interior created a safe platform for women to report abuse, turning digital ad space normally used for advertising women’s products into a means of talking to women suffering from abuse. It created targeted ads for women on Facebook and Instagram offering them a safe way to ask for help. These adverts would not appear on the social feeds of their male aggressors. A simple change of font in an email message changed the lives of many sufferers through a simple, hidden message. Also see here: Festival Intelligence: Colombia ramps up social media for a greater cause. The final entry in our trio of most awarded campaigns is UNICEF’s ‘The Worst Soap Opera’ by OMD in the Dominican Republic. It picked up two Gold awards for ‘Best Branded Content’ and ‘Best Use of Traditional Media’ in addition to two Silvers for ‘The Effectiveness Award’ and ‘Impact Award’. Judges praised the campaign for bringing “a difficult social issue to a wider audience through television”. This campaign was centered on the fact that 37% of women in the Dominican Republic get married before turning 18, and 12% before their 15th birthday — and the law allows it! Given the unfruitful attempts made over the years to modify the legal framework, UNICEF set out to make this a matter of national interest and demand action from the government to change the law. OMD had to find a way to create a real emotional connection, stimulate discussion and incite social change. The best way to get the attention of its audience was to tell a story, to show all the negative implications of child marriage in the context they were most passionate about. A 10 episode soap opera was created to deliver the message. It told the story in a raw way to provoke disgust in the viewers, in an effort to make them feel uncomfortable and demand the TV networks to take the soap opera off air – all to get the support of the public, celebrities, the press and, most importantly, get government officials to change this law. Congressmen spoke publicly about the necessity to modify the law, and even the Vice-president got involved. The result: a new law was made prohibiting marriage until 18 years of age, without exceptions. Also see here: Festival Intelligence: Human nature powers LatAm’s most effective campaigns. All in all, three of the most pertinent themes to take away from the Festival of Media LatAm Awards 2018 are ‘People’, ‘Power’ and ‘Purpose’. From tackling a range of human issues around culture, diversity, inclusivity, and even touching on female empowerment by giving women a voice to speak up, the impact of not just these — but a significant number of the winning campaigns — shows that brands have the power to drive social change and it all comes down to having a purpose. Check out the full list of Festival of Media LatAm Awards 2018 winners here.